We aimed to create a strong impact on points of sale when developing frozen pasta packaging design for Vittamassas. 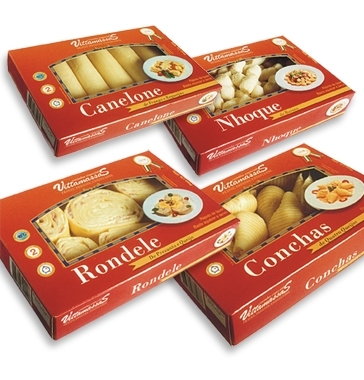 As a strategy to outstand from competitors´s products, we choose to use red for the background color of the packages. Red is a warm and stimulating color. The strong mass of color created by the sum of the line´s different products would contrast other brand´s products. For the frozen pasta we created a cardboard box with a transparent plastic window that enables viewing the product. Good viewing of the product is an influential factor during a purchase decision. Following the same graphic style we developed label design for the sauces. Aiming for a “gourmet”character, we used darker colors for backgrounds and images of the ingredients displayed on wooden boards. The result was an increase of 40% to 120% in sales two months after the launch of the new packages. Feedback from consumers further exceeded client´s expectations.